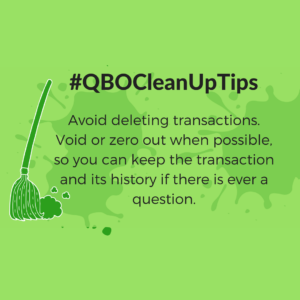 Today’s Cleanup Tip is simple, avoid deleting transactions – just stop it! But, you may be asking yourself, why? I need to get rid of the mess. In any sort of cleanup engagement, there is always a possibility that something you did is going to come back to haunt you. So, if you delete a transaction, you might find yourself needing it again down the road. So, to save yourself some time and energy, just don’t delete the transactions. What should I do instead of deleting transactions? That’s easy – Void the transaction! When you void the transaction, the amount no longer impacts your financial statements, but you keep the form and its audit history. This allows you to research any changes to the transaction and give you an easy form to bring back any of the information that you might have lost, in case you are haunted by your prior cleanup actions. What happens if I can’t void the transaction? 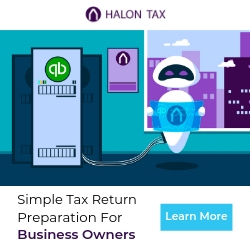 You’ll notice that there are several types of transactions in QuickBooks Online that cannot be voided, journal entries and deposits are two good examples of this. So what do we do? We manually void them. Just change all of the amounts to zero. Now, those transactions won’t show up on a void or deleted report, but the reward here outweighs all of that. Again, you keep the actual form and the audit log. In summary, always VOID transactions and avoid deleting transactions in QuickBooks Online. The last thing you want to do is to reference the audit log in one window while recreating the transaction in the other one. A simple void is going to save you a ton of time if you ever have to fix an error – and I’m all about finding the most efficient way to get through a cleanup engagement. For more tips on how to handle cleanup engagements, check out my QuickBooks Online Cleanup Master Course.